The generated power of wind turbines is extremely erratic owing to the intermittence nature of wind speed which can highly affect both the quality and the planning of power systems. 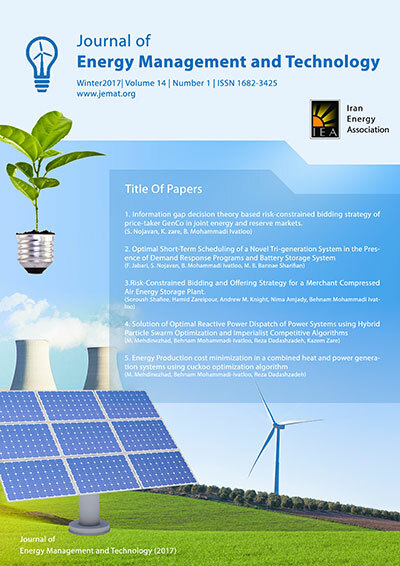 Energy storage systems (ESSs) can provide a satisfactory solution for wind power applications by alleviating the harsh fluctuations pertaining to wind production and also providing ancillary services to the power system which in turn causes to increase the infiltration of wind power in the power systems. Previous studies represent that suitable location and size of ESS units in the distribution networks can bring many beneﬁts such as peak shaving, loss reduction and reliability improvement. Under this context, this paper proposes a new risk-based method to determine optimal location and capacity of ESS units and wind turbines simultaneously. The proposed method is formulated as multi objective model which includes three objectives: monetary cost, technical risk and economic risk. In addition, the uncertainties considered in this problem include: (i) future load growth of system, (ii) wind generation and (iii) electricity market price. The aforementioned uncertainties are modeled using fuzzy numbers. The proposed optimization problem has been successfully solved using non-dominated sorting genetic algorithm (NSGA-II) and eventually, a “max-min” approach is employed to select the best solution among the obtained Pareto optimal set. The numerical studies performed on the 9-node and 33-node distribution systems indicate the advantages and sufficiency of the proposed methodology.